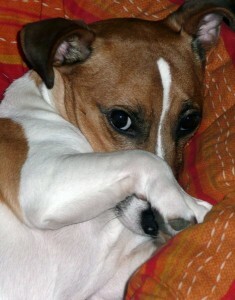 Fear and shyness are common problems with many dogs. Is your dog shy of new people, other dogs, kids? Is he afraid of storms, fireworks, sudden noises, the car, or going to the vet? Are you worried that your shelter or rescue dog has been abused? We can help. We see more dogs with shyness and fear than with any other serious behavior problems. Both of our owners began their behavior consulting careers doing fearful dog training, and we have helped thousands blossom into happy, confident, safe family pets.A variety of factors contribute to shyness and fear in dogs including socialization history, traumatic experiences, genetics, and medical conditions. Our expert behavior consultants have the expertise necessary to determine the nature of your dog’s fears and to design a custom training plan to overcome them. The amount of work necessary to help a dog overcome his fear varies depending on the nature and severity of that fear, but we have training programs for every dog. Dogs seldom “outgrow” the behaviors associated with fear & shyness. The more often that a dog experiences fear, the more ingrained the emotion becomes. The sooner you start, the easier the problem will be to fix. Fear in a young dog can lead to aggression as the dog matures. Immediate action in especially important in puppies. Medical factors often play a role in fearful dog behavior. If your vet didn’t refer you to us, please consult them. The key to overcoming a dog’s shyness of people is often to teach you to “speak dog.” Some friendly human behaviors actually look a lot like threats in natural canine body language. Once we teach you to understand what scares your dog and how to read his subtle ways of telling you that he is afraid, you’ll be well on your way to overcoming mild to moderate shyness. More severe cases require a structured training program to gradually change your dog’s attitude towards things that scare him. Traditional dog obedience training techniques or even exposing your dog to too much too soon can exacerbate fearful behavior.